I have been forced to throw out the majority of my bacon, which was a sad day for me. Well, by throw it out I mean that I fed it to my dogs. While the first piece was pretty good, I don’t think that the rest of the bacon cured properly. I left it in the fridge for almost a week and then when I went to cook some up yesterday for a fry up breakfast (with homemade eggs) I noticed that the bacon had a bad aroma, and felt a little slimy. I decided it would be safer to not eat it. I have been trying to work out where I went wrong. It could be that I failed to use Nitrate in the process…. 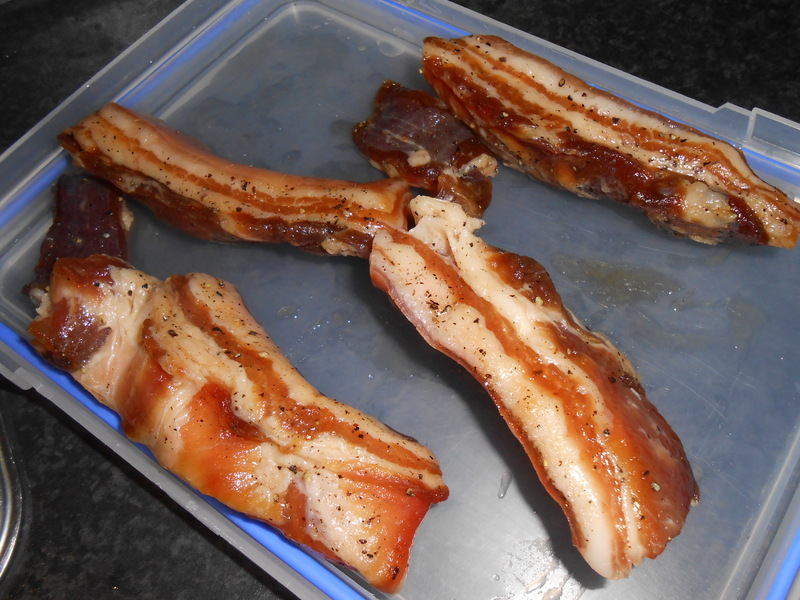 Could be that I needed to smoke the bacon (although the recipe I followed did not require this). I feel a need to get this worked out so that I can really know that I can cure Pork into bacon. My Bacon in happier times. I have seen a shop near me in the suburb of Moonah called “Brew by You”. They sell home brewing supplies as well as some products to assist in the creation of cured meats. I decided that I would have a look. On a side note, and if you are not from Tassie you would not be aware of this, I have never encountered such a diverse and original range of business names in any other location. We have hair salons called “Upper Cut” and “Hairport”, a chain of BBQ chicken takeaways called “Legs and Breasts”, and a handyman service caller H.E.R (Household Electrical Repairs). Anyway, I visited the shop “Brew by You” and I was blown away… so many cool things in there. They sell beer brewing supplies of course, with the usual pre-mixed/concentrated formulas. They also sell materials such as hops and malt so you can make your own beer from the basic materials (which is something I want to do as a 13 skill this year). They sell items to distil spirits, which is something I am very keen to try… although at $790 for a kit it is a little out of my price range. I also found equipment and supplies to allow you to make your own cheese. I have made some soft cheese from Greek yogurt last year, I would like to progress to making some more exotic cheeses when I can afford the time and equipment. Finally, they sold equipment and supplies to make cured meat. These ranged from flavours to add to jerky, sausage skins, presses and ingredients, materials to cure fish, smoking equipment. Pretty much everything I needed. I asked about buying some nitrate, they mentioned they are out, yet should have some in next week. I will go by then and pick some up. Anyway, I was very impressed with this shop. I am at the end of week 2 of my full time Tap-Out training. I am not having a lot of fun with it, and often when I am halfway through a workout I want to throw in the towel. It is so hard to get through the workouts… I can’t breathe, my heart is racing like crazy and sometimes I physically can’t do another push up or sit up. I keep going through till the end of the disc… mostly because I have told so many people that I am doing this work out and I don’t want to quit. While I do feel a lot fitter, and I can see an improvement (so do other people… some of my friends have noticed my slightly improved physique), my scales tell me a different story. Apparently I have lost 300g in the last 10 days, with no loss in fat. I don’t think my scales are really telling the whole story, and I have been told by fitness obsessed friends that the body fat scales can not be relied on for an accurate reading. I will keep training and not quit, because as they say on the Tap-out DVDs, “there is no quitting in Tap-out”. At the very least, I won’t quit as I would be disappointed in myself.